From girls to boys in the Riot Club. Danish director Lone Scherfig, of the films An Education with Carey Mulligan, and One Day with Anne Hathaway previously, is finishing up her next film titled Posh. Adapted from a play of the same name, Posh is about the two first years at Oxford University, played by Max Irons and Sam Claflin, determined to join the notorious Riot Club - a place that can make or break your time in higher education and, possibly, life. A major event happens at the Bull's Head pub, which can be seen in the background of one of these first look photos. These two shots just debuted online from the UK - take a look. 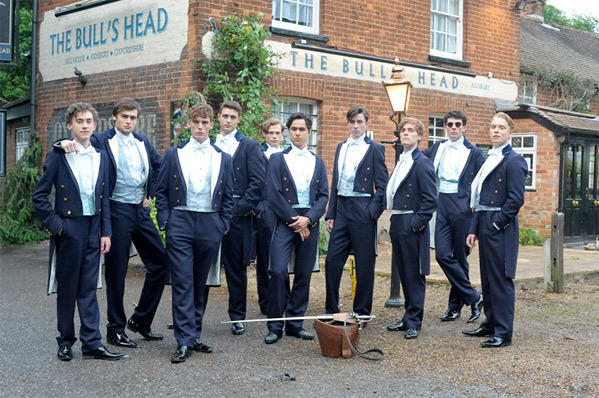 In Posh, two first-year students at Oxford University join the infamous Riot Club, where reputations can be made or destroyed over the course of a single evening. Max Irons and Sam Claflin play Miles and Alistair, the two first years. During one night at the Bull's Head pub, "ambition and avarice lead them down a dark path." The cast includes Holliday Grainger, Sam Reid, Douglas Booth, Natalie Dormer and Jessica Brown-Findlay. Scherfig is quoted in Empire as saying that the film isn't making any big comparisons, instead "it's more dynamic and energetic and dramatic and tough than the films I've done previously." Posh is scheduled for a UK release in September this year, but doesn't have anything set in the US yet. Expect to see it at TIFF.